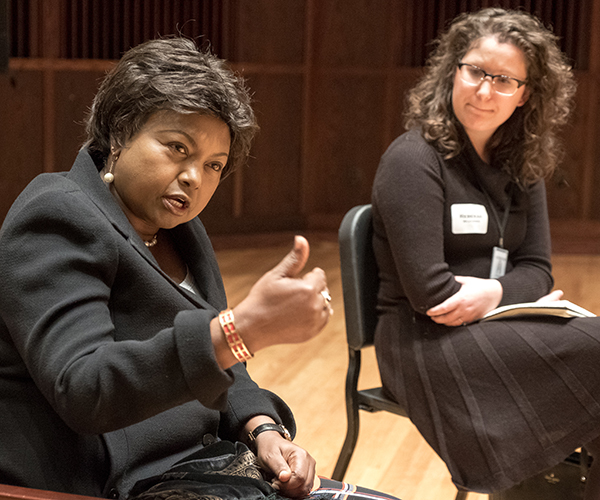 Reconciliation, justice and empowerment were common themes during a talk given by Her Excellency Mathilde Mukantabana, the Rwandan ambassador to the United States. 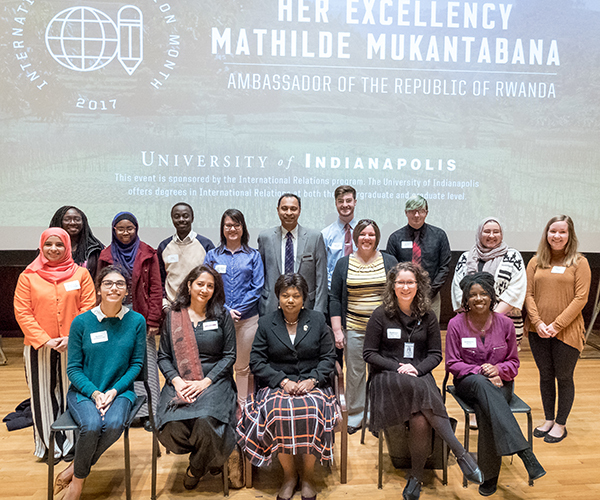 The University of Indianapolis welcomed Ambassador Mukantabana on Oct. 27 for a group discussion with students and faculty. 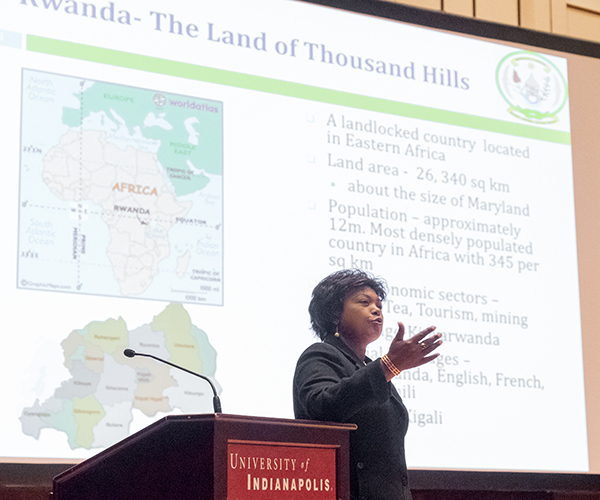 “You can’t appreciate what Rwanda is today without going back,” said Mukantabana, who discussed the magnitude of the 1994 Rwandan genocide against the Tutsi people, which claimed more than 800,000 lives. Noting that the genocide left no family untouched, Mukantabana outlined how her country continues to recover from the tragedy and sets an example in its approach to development. 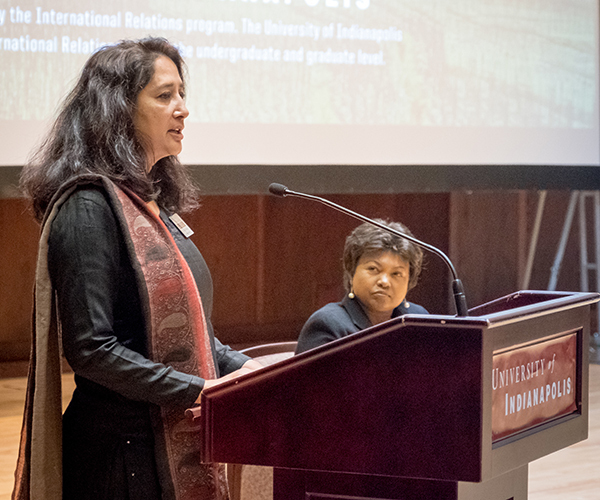 The ambassador speaks with organizer Jyotika Saksena, associate professor and director of the University's graduate program in international relations. Milind Thakar, associate professor and chair of international relations, conducted a question and answer session. 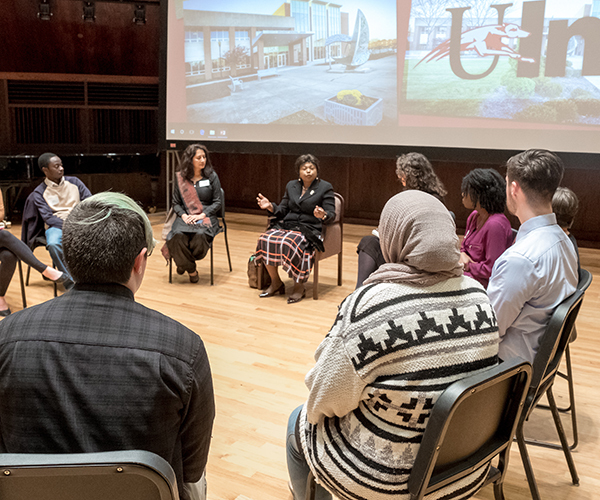 Mukantabana met with students in a round-table discussion on the stage prior to delivering her lecture on on Friday, October 27, 2017. Saksena made remarks prior to the ambassador's talk. 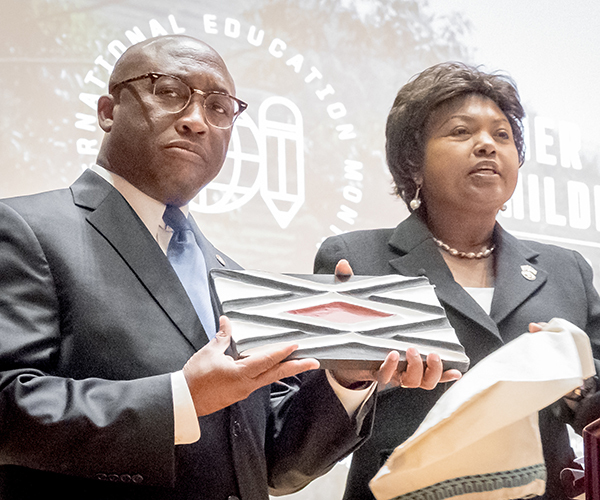 “It was an uphill battle because there was no road map,” said Mukantabana. She explained that Rwandans made the decision to focus on national unity and disavow the tribal politics that led to unimaginable violence 23 years ago. Mukantabana, who was forced to flee her Rwandan home in 1973 to escape escalating violence, lost numerous family members in the genocide, including her parents and siblings. In response to that horror, Mukantabana launched a social work program at the National University of Rwanda to train students to work in local governments or non-governmental organizations and to help survivors deal with the trauma of genocide. 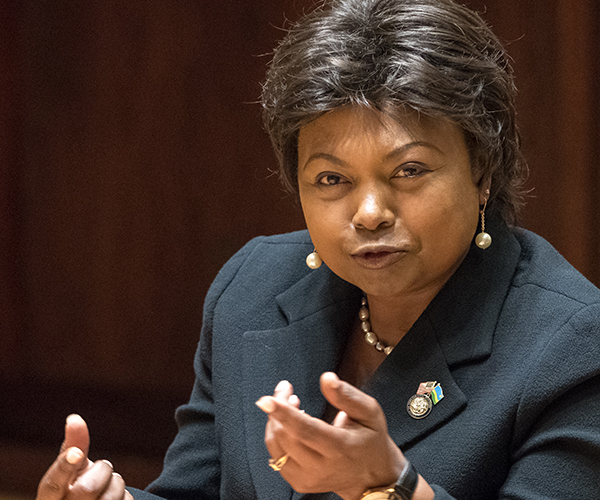 She also co-founded and became president of the Friends of Rwanda Association and served as executive producer of “The Rwandan Night,” a documentary about the genocide. 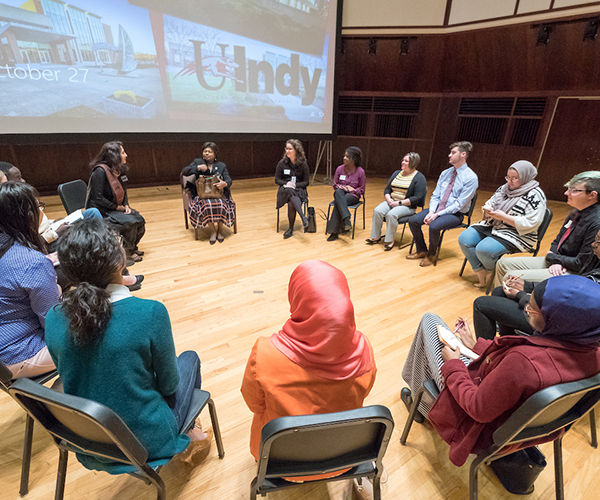 Learn more about UIndy’s international relations program here. Since the genocide, Rwanda has taken significant steps towards healing and reconciliation, including the creation of the National Unity & Reconciliation Commission in 1999. The country also has made use of traditional courts as part of the peacebuilding process. “You can’t talk about forgiveness or reconciliation when there is no sense of justice. How do you judge 3 million people?” the ambassador said. 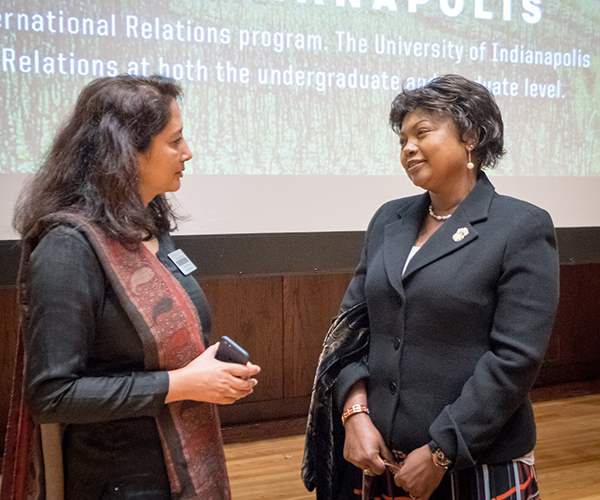 The visit to the UIndy campus was coordinated by Jyotika Saksena, who directs the International Relations Graduate Program on campus. 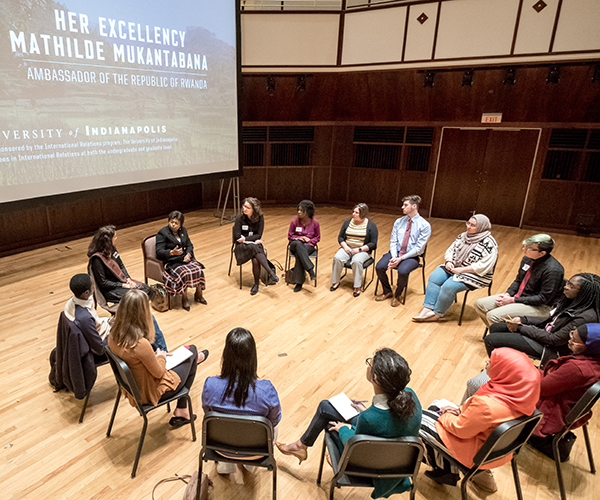 Provost Stephen H. Kolison, Jr., said the perspective and insight provided by Mukantabana aligns with the University’s vision of expanding its intellectual life by teaching students of the interconnectedness of the world around them. Governance and sustainable development, including programs to improve the lives of Rwandans living in poverty, have played a significant role in Rwanda’s growth. The country’s system of inclusive ownership builds a sense of community through homegrown solutions and gives people agency, Mukantabana said. Other notable developments include a larger role for women in positions of power. “The empowerment of the people is for all people,” she said, noting that 64 percent of Rwandan’s parliament is female. The UIndy football team (8-0, 5-0 GLVC) debuted at No. 2 in the season’s first set of NCAA Super Region Three regional rankings, released Monday. One of three unbeaten teams in the region, the Greyhounds trail only defending-national-champ Northwest Missouri State. The Hounds remained at No. 6 in this week’s AFCA Division II Coaches Poll. The top seven teams from the country’s four regions will earn berths in the NCAA Division II Playoffs. The No. 1 seed in each region will earn a bye, while seeds 2-4 will host seeds 5-7 in first-round action Nov. 18. The bracket plays out on consecutive Saturdays until a champion is crowned Dec. 16. Undefeated Fort Hays State, who plays NMSU Nov. 4, comes in at No. 3, followed by GLIAC-schools Ashland and Ferris State at four and five, respectively. Central Missouri and Grand Valley State round out the top seven. The NCAA shuffled the regions this year, with the Greyhounds moving out of Super Region Four and into Super Region Three. A total of 42 schools from the GLVC, GLIAC, MIAA and GAC comprise the third region. UIndy is looking to earn its fourth-ever trip to the Division II playoffs. The Hounds qualified in 2012, ’13 and ’15, earning the program’s only postseason victory in 2012. UIndy also qualified for the postseason as a Division III institution in 1975. Story by Ryan Thorpe, associate athletic director for communications, University of Indianapolis. When it comes to weather, the forecast in Indianapolis can be pretty unpredictable from one day to the next. 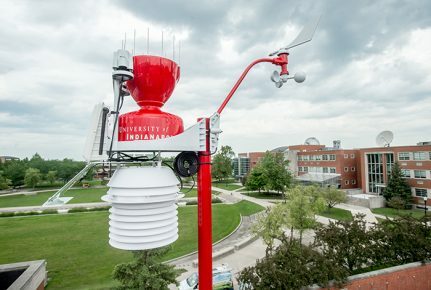 A new weather station installed at the University of Indianapolis this week will help meteorologists and the community try to make more sense of incoming weather data. 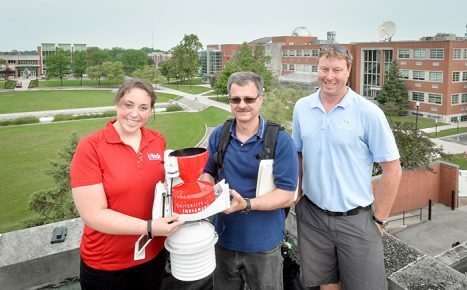 A solar-powered WeatherSTEM unit providing up-to-the-minute weather data on temperature, wind speed, humidity, rainfall, barometric pressure and many other statistics was installed atop the roof of the Schwitzer Student Center in mid-July. The system also has a sensor in the ground to report soil moisture and ground temperature. The data from the unit is available now on an interactive website, an app, Facebook and Twitter – allowing the UIndy community and general public to monitor the weather near campus and receive alert notifications. The information is available 24 hours a day and will be used by different groups across campus for safety and research purposes. The WeatherSTEM station is the result of UIndy faculty and student collaborations to bring new technology to monitor and research weather patterns and atmospheric conditions. Recent Earth-Space Science grad Carly Nicholson ’17 began discussing the idea of a weather station with associate professor Tim Duman nearly three years ago. This spring, she authored a grant to help find financial support for a WeatherSTEM unit. It didn’t take long for UIndy alumnus Bob Green ’70 to take action. From left: Carly Nicholson ’17, Dr. Tim Duman and Luke Hunnewell of WeatherSTEM. “UIndy is now a hub of meteorological data. The campus and surrounding community have the opportunity to become more intimate with the weather they experience day to day with use of the WeatherSTEM website, app and social media,” says Nicholson who is currently pursuing her master’s in public affairs and environmental science at IU Bloomington. Green’s gift to support the WeatherSTEM station is in honor and memory of Dr. William Gommel, a professor of Mathematics & Earth-Space Science at the University from 1965 to 1992. “I have a hunch that Professor Gommel would be pleased to know that one of his favorite topics – meteorology – has an ongoing presence on the UIndy campus in the form of a live weather data system,” said UIndy alumnus Bob Green ’70. Members of the community are invited to attend a special dedication ceremony of the WeatherSTEM weather station during Homecoming Weekend on Friday, September 29. Register now. Nitro Circus Live brings breath-taking stunts and choreographed action to the University of Indianapolis on Friday, July 28. Hot from the 2017 Nitro World Games in Salt Lake City in June, athletes will perform tricks in freestyle motocross, BMX and skate, plus all manner of crazy contraptions off the one-of-a-kind 40-foot Nitro Gigant-A-Ramp. The two-and-a-half-hour sports-performance show offers a fun family night, with a blend of daredevil action and athletic camaraderie. Nitro Circus will bring in additional seating, staging and ramps to transform Key Stadium for one night only. Rachelle Merkel-Diaz, director of summer programs at the University, said Nitro Circus is just the beginning as UIndy expands event offerings that appeal to the broader community. Events like Nitro Circus tie in with the University’s strategy to make the Indianapolis south side a destination point that enriches local neighborhoods, with UIndy as an important anchor. “We’re excited to host Nitro Circus at the University of Indianapolis for the first time. This is a fun, unique event for the whole family, and everyone is invited to come and check it out,” she said. Merkel-Diaz said residents can expect to see more events happening as the UIndy footprint grows and enhances community partnerships. Jeremy Rawle, Gregg Godfrey and action sports superstar Travis Pastrana launched the Nitro Circus concept from their garage in Utah in 2003. Since then it’s grown into a worldwide phenomenon, with a series on MTV that aired in more than 60 countries. The show has toured five continents, with sold-out shows in Australia, New Zealand, China, the United States, Canada, South Africa, and all across Europe. Bob Brubeck, assistant athletic director for facilities & operations, was instrumental in bringing Nitro Circus to the UIndy campus. He became familiar with Nitro Circus through the television program on MTV. “I thought it would be cool to do it here,” Brubeck said. When Nitro Circus organizers got in touch with him seeking a venue in Indianapolis, he seized the opportunity. The event could attract as many as 10,000 spectators to campus, making Nitro Circus an ideal way to showcase UIndy’s amenities. “Many people from the area will be able to see the University and what we have to offer,” Brubeck said. Buy tickets here. Use promo code “HOUNDS” to get 20 percent off. The University of Indianapolis is buzzing with activity as summer camps, classes and conferences are in full swing this June. 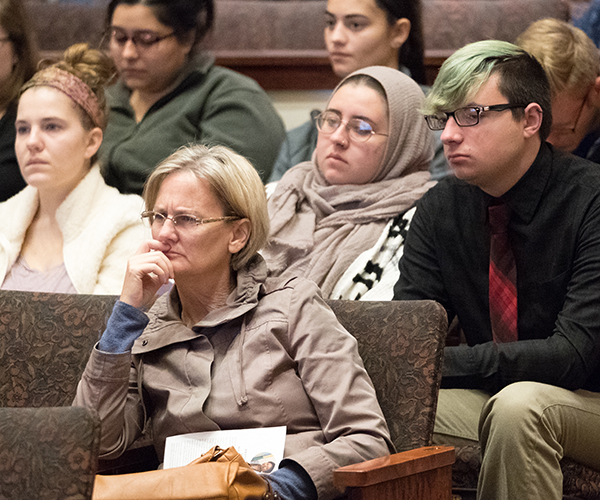 It’s part of the University’s broader goal to engage with the local community year-round by offering valuable campus resources for families, businesses and professional organizations. Between June and August, the University will host dozens of events on campus. Conferences include Teach for America’s annual academy, Indiana Choral Directors Association Summer Conference, 4-H Leadership, National Association of Black Accountants Accounting Career Awareness Program (NABA ACAP), Melody Makers of Indiana and Nitro Circus. 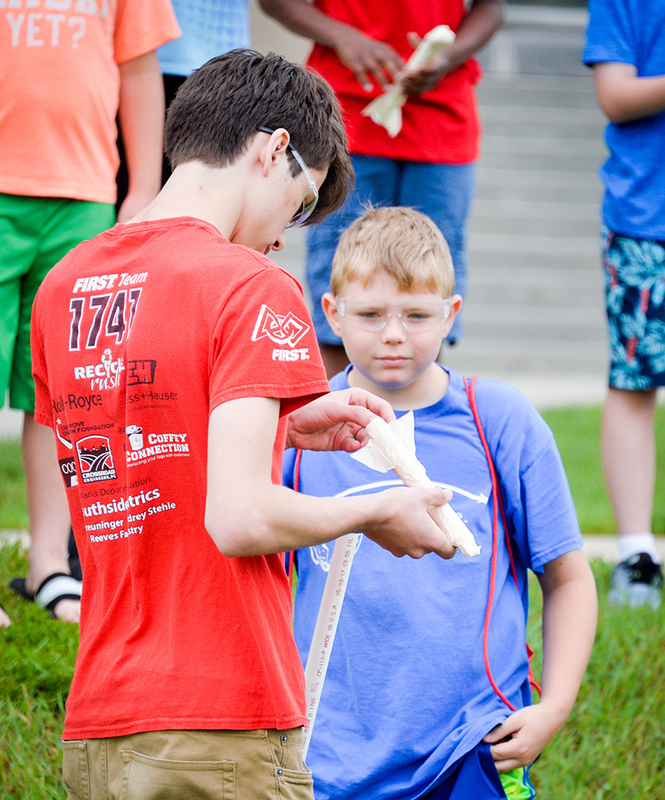 Summer camps focus on a variety of sports, including football, swimming, basketball and volleyball and subjects like math, writing workshops, robotics, art and multimedia game development. UIndy summer camps offer opportunities for second graders to grandparents. 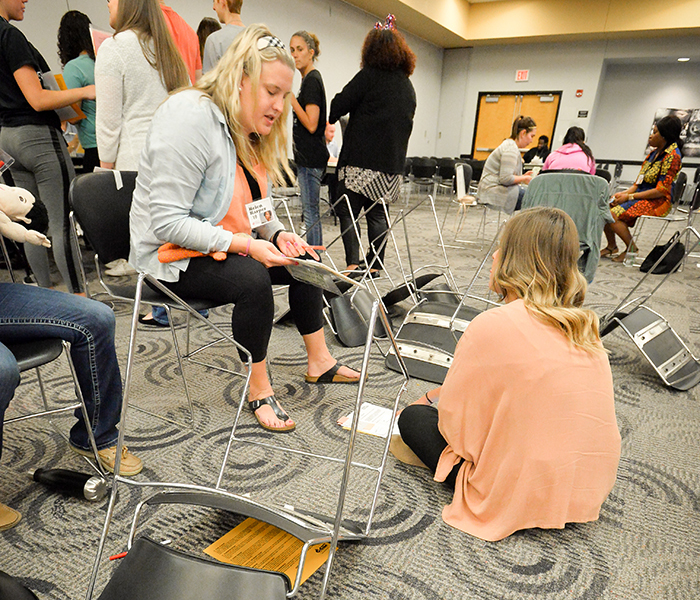 Students from a variety of health disciplines learned firsthand recently the challenges faced by low-income families in a Poverty Simulation held on the University of Indianapolis campus. 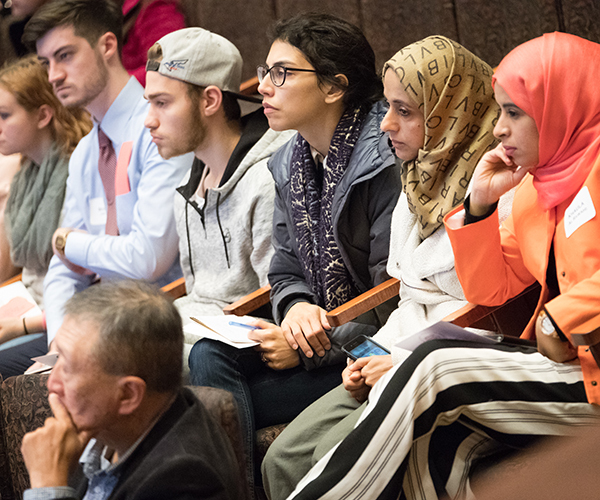 The Poverty Simulation, organized by Anne Mejia-Downs, associate professor, and Julie Gahimer, professor, Krannert School of Physical Therapy, serves as an introductory activity to the Doctorate of Physical Therapy (DPT) Service Learning Course. DPT students were joined by PT assistant, nursing and public health graduate and undergraduate students for the event. Etchings Press, a student-run press at the University of Indianapolis, has announced its annual publications for 2017. This year’s winners were Christopher Mohar’s novella The Denialist’s Almanac of American Plague and Pestilence, Danny Caine’s poetry chapbook Uncle Harold’s Maxwell House Haggadah, and Sarah Cheshire’s prose chapbook Unravelings. Each year, students publish two issues of their university-based literary magazines, a novella, a poetry chapbook, and a prose chapbook. The press aims to publish excellent, purposeful literature and to allow a variety of voices the opportunity to share their stories. 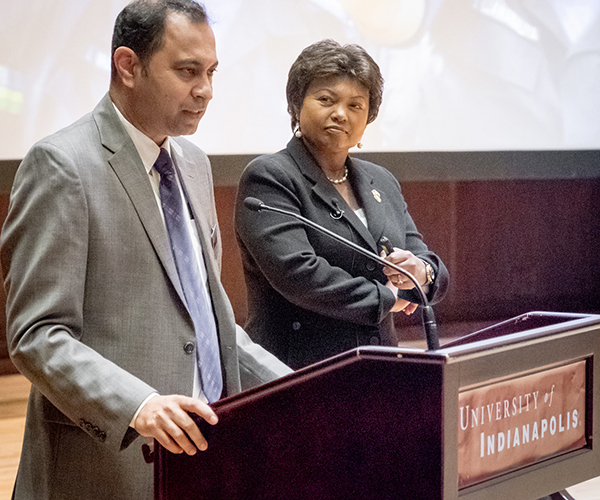 The University of Indianapolis community came together April 25 to support the second annual UIndy Day, contributing 470 gifts totaling more than $39,000 to support students, academics and scholarships. The Class of 2010 was the top class supporter of the campaign. This day of giving presented opportunities to support special projects, helping them earn an extra $1,000 from the UIndy Alumni Board of Directors. 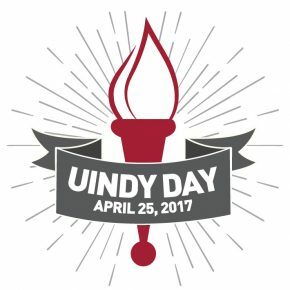 The UIndy Scholarship Fund, Letterpress and Simulation Mannequin projects all met the challenge by surpassing 50 donors. The UIndy Scholarship Fund received the most support from 97 donors, earning it an additional $1,000 match. Ten additional matches and challenges were created by Greyhounds, inspiring an additional 88 donors to make a gift. University of Indianapolis President Rob Manuel with Drew Petersen, winner of the 2017 American Pianists Awards, Christel DeHaan Classical Fellow and Artist-in-Residence at the University of Indianapolis. Drew Petersen, who will perform as Artist-in-Residence at the University for the next two years, was among five finalists who performed in the American Pianists Awards New Music Recital in April at the Christel DeHaan Fine Arts Center. The recital led off the final week of a 13-month competition involving some of the world’s top pianists. Navigating the transition from education to a career has always posed challenges for graduates. With today’s employers focused on soft skills like collaboration and problem-solving, the demands of the modern workforce require new solutions. 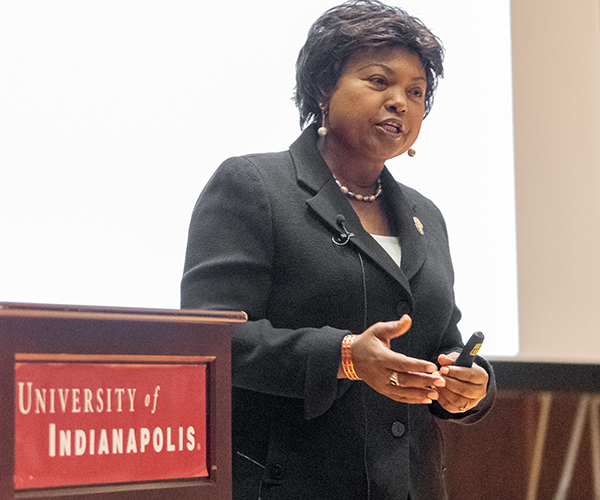 The University of Indianapolis recently hosted an event, Pathways to Prosperity: Rethinking the Transition from Education to Career, to explore the new approach universities are taking to prepare students for successful careers. Jeffrey J. Selingo, author of “There is Life After College.” Pathways to Prosperity: Rethinking the Transition from Education to Career held in Schwitzer on April 10, 2017. Photo by D. Todd Moore. The event was co-hosted by the University of Indianapolis, Strada Education Network (formerly USA Funds) and author Jeffrey J. Selingo. A group of local, state and regional education leaders, business executives and policymakers joined the collaborative workshop to explore how schools and universities can better equip students to succeed.